This downtown hospital Concept is not about regional healthcare, it's a cover-up! A cover for the failed company and job attraction efforts of the Mohawk Valley EDGE. We're tracking the results of MV EDGE, their involvement in the new Utica hospital, regional healthcare, and their president's concept to bulldoze Downtown Utica - which is the last straw! Steve worked to hook the hospital board. MVEDGE's main focus has been the former airbase in Rome and also UticaNano. Before that Steve leveled plenty of downtown Utica in other urban renewal schemes. February 16, 2018 - Looking into #Emailgate we read MVEDGE president, Steve DiMeo say, "I guess the hospital can reduce costs if they just go and put this on the St. Luke's campus." 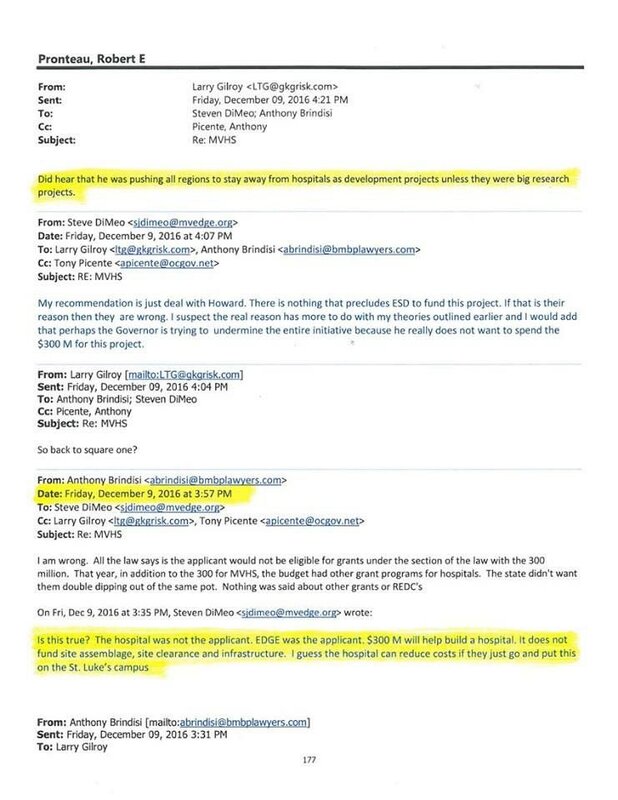 Then there are these MV500 Emails Regarding The Downtown Utica Hospital too. We tried to obtain information about the Downtown Utica hospital concept, Steve DiMeo told us "NO!" April 17, 2017 - One theory, Steve DiMeo hoping to be seen as an overachiever aiding Governor Cuomo, pulled-out all the stops to rebuild a downtown he sees as "obsolete and totally blighted". He's wrong, and his downtown hospital concept will fail. The good news is that we'll save Utica from joining 20 Failed Projects Involving Eminent Domain Abuse, where we read: "The argument is always the same... tax-hungry bureaucrats and land-hungry developers claim that the use of eminent domain is necessary for economic development. They promise everything from high-rise condominiums to trendy shopping malls, all in the name of more taxes and jobs. There is a strong incentive for cities and developers to over-hype the benefits of individual private development projects involving eminent domain in order to garner political and public support. But it turns out that many of these projects are failures. This report details 20 prominent examples"
However, this past week we learned that the planning information is not available to residents and taxpayers who have questions. This per their President, Mr Steven DiMeo "EDGE is a private, New York not-for-profit corporation... EDGE has no plans to search files for the records which you seek..."
Meanwhile nearly all of Mohawk Valley EDGE's $5,000,000+ dollar budget comes from New York State taxpayers. Interestingly, the CEO of the Mohawk Valley Health System, Mr Scott Perra, also sits on the Mohawk Valley EDGE's Board of Directors. This maybe be all-good-and-well, however just don't ask questions about funding, the hospital concept, etc. as these leaders have our very best interests at hand, right?